Any reasonable built quadcopter consists to 30% of zip ties, duct tape, hot glue, and of course heat-shrink tubing. The latter is often processed with a gas lighter. I must admit that most of the time I used a lighter as well. Once you figure out how much heat (or fire) your heat-shrink tubing and fingers can withstand this works quite reliable. The better the heat-shrink tubing quality, the less burned and melted mess is produced. The proper way, using a hot air gun, sounds quite expensive, right? Aside from this, a hot air gun comes in handy when you want to repair your broken electronics and need to remove and swap fined pitched and/or high pin count components. I do a lot of electronics and need to do some reflow SMD components from time to time. As I can neither afford a reflow oven nor do I have enough space for that kind of machine, I use a hot air gun for that. You might have read about my upcoming adventure of fixing broken quadcopter electronics. In the course of these upcoming posts I want to show you how to repair your stuff. This all makes no sense when you have to spend hundreds or thousands of dollars to fix your burned up $10 ESC. 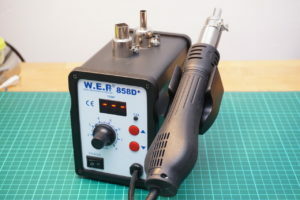 Beside from a powerful soldering station, most of the time you will need a hot air gun for component removal and replacement as well. This is why I started looking for a cheap alternative to the fully blown reflow soldering stations people normally use. The first item I tested was one of those cheap 8018lcd integrated hot air guns. I should have done more research before the mouse-clicking-buying-reflex took place. Those devices are absolutely crap. Really! Do not even think about buying it. There are two main reasons. The first reason is that some of those have a manufacturing problem, it seems like they used a wrong or counterfeit transistor that is prone to break within the first 10 minutes of use. Sure it’s fixable and you can rework those really bad solder joints on the PCB along the way but this is not the main issue. The worst thing is the non-existent temperature control! You might think, there is a nice LCD and a temperature knob. And indeed it shows and controls “some” temperature. I have no idea where this temperature is being measured, it has no correlation to the temperature of the exiting air stream! This renders this thing useless, there is one thing you want your heat gun to do: produce a steady air stream at a given temperature — and this device does none of it. Fail. In summary this thing is huge, noisy, stinks (softening agents), has no temperature control whatsoever, and gives you a weak air stream. DO NOT BUY! Being reasonably priced with the key features I need this thing looks like a bargain, they even use a brushless fan for quiet operation (blheli_s?). It’s getting even better, the clones of this cheap station come at $35 shipped. My research showed that most of the clones are OK quality wise, only rarely messed up with bad (dangerous) cabling of the mains voltage. But this can be spotted and fixed easily. I grabbed my clone called W.E.P 858D+ from ebay for 32.95€ inclusive fast shipping from germany. Bangood also lists two 858D+ stations, the dangerous one with the bad plug and the recommended wired version. UPDATE: DO NOT buy the station from banggood! It (sometimes?) comes without isolation between heater and shell and trips your circuit breaker… (thanks jaap for pointing this out!) Browsing aliexpress.com yields several stations for $35. There are some things you want to check before and after buying one of those stations: Buy one of the newer versions with the tool cable fixed to the station. The previous versions used a male connector at the station, exposing the mains voltage when the tool was disconnected (!) Also make sure to buy the version matching your mains voltage (110V or 240V). Once the item arrives at your place you really want to check the connectivity of the protective shield wire. Take your multimeter and measure the resistance between the protective shield on the mains plug and the metal parts of the station and the hot end tip. Your readings should be as low as possible. Mine measures 1.2 Ohm, not perfect but should do. The output temperature can be adjusted by using the red up and down buttons and the airstream can be adjusted using the black potentiometer knob. It simply does what it is supposed to do and has a very convenient and easy to use interface. The nice thing is that there is a reed switch inside the hot end: When you pick it up it heats up quickly and when put back into the holder it will cool down and enter standby automatically. Really nice! I made a short demonstration video of this hot air station. There are going to be more reflow and hot air rework tutorial videos once the first broken scrap parts to be fixed arrive — stay tuned! 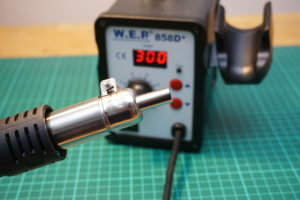 For tube shrinking and hot glue removing I bought LS-300 heat gun – https://goo.gl/KqvGN3 – cheap and simple. Replaced the original AC wire because stock wire was three times too short. I still use it. No problems so far. However because I started to fix mine ESCs, FCs, VTX-es and googles and sometimes require to build tiny signal inverters, switches and other simple circuits with SMD elements for mine quads, the question about not expensive hot air gun for SMD soldering which wouldn’t break in first two-three years considering usage frequency once at two weeks is still open. 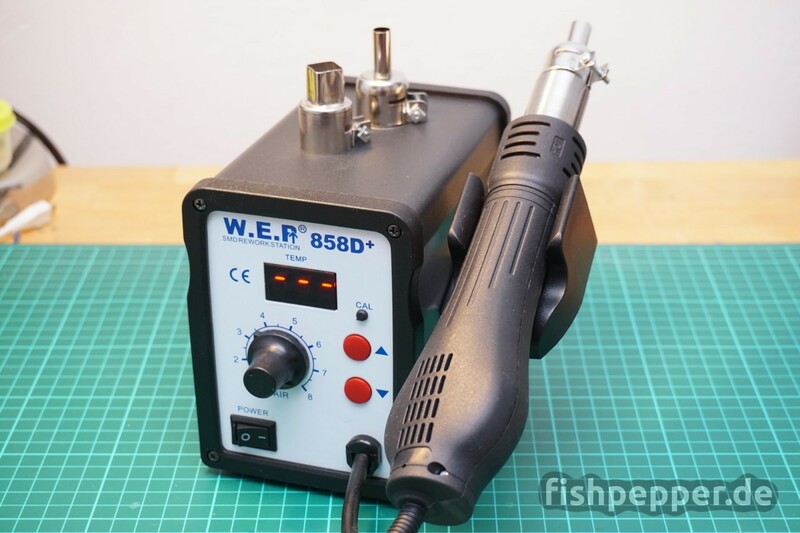 What you’re think about Bakon SBK8586 https://goo.gl/Hh5aKj or similar hot air soldering station? Are there is something not expensive and better too? The LS-300 looks quite nice for heat shrinking only, expecially it does not look that big like the 8018 actually is. The 858 station takes up some space as well. So if you do not plan to do reflow soldering this thing will probably do as well. The SBK8586 seems to use the same fan and heater assembly as the one I use. I have not done any research about it. Maybe have a look at the eevblog forum, I found lots of information on the 858 there. Anyway personally I would always prefer two separate units. This way I can take the small soldering station with me on events etc. I have the same one, just without the + sign. It gets the job done, I am very happy with it. Do you happen to know what is the difference between 858D and 858D+? Mine measures 1.1Ohm between the plug and metal parts, and 2.3Ohm between the tip and the plug. Goes up to 500C really quickly and has a brushless fan with speed control up to 120L/min.